Funky to me, would usually indicate a contamination with wild yeast or bacteria. But this would be apparent in strong sourness, or some barnyard-y funky Brettanomyces character, or a whole host of other indicators, including the likely formation of a pellicle on top of your fermenting beer. If you otherwise taste clean beer it is possible that she is talking about the yeast bite from unfiltered beer. You could take a bottle that has been in the fridge and settled clear for at least a week. Carefully decant the first half into one glass. Then, swirl the remaining liquid to rouse the yeast and pour that into another glass. Ask her if one or both samples taste 'funky'. Is she drinking the beer straight out of the bottle? If so, after the first drink sip sediment will be stirred up from the bottom of the bottle. If it turns out she doesn't like yeast in the beer, you can make sure she uses a glass and that she is not pouring the last 1-2oz out of the bottle, or you can use finings before your transfer to the bottling bucket to further clear the beer after fermentation. There is some stuff called Biofine Clear that is vegan friendly and works incredibly well. Taste paneling is a very difficult thing to do. 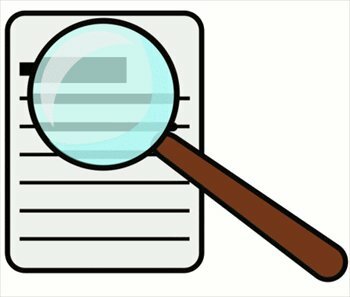 Vocabulary is different, not to mention tolerance thresholds for different compounds. So it is entirely possible that you have a brewing/fermentation issue, say with high levels of diacetyl or DMS, but if you aren't sensitive to it, you won't notice it. Hmmm. I doubt it's an infection as I haven't noticed any pellicles. And she likes to pour most of it in a glass, and then drink the yeasty beer left in the bottle first. I think you may be right about the DMS. I brew on a stove top with 2x 5 gallon pots, and I leave the lids about halfway on. Is it possible that I need to leave the lids off, or that I'm not boiling hard enough? And what would cause diacetyl, is that a fermentation temperature thing? I use a chest freezer with a temp controller so I know I'm fermenting at the correct temperatures. Yes, you should be leaving the lids off completely. DMS is driven off during the boil. If you were to capture and condense the steam coming off the pot, it will smell like corn flakes. Ideally you want to boil off about 10% of your kettle volume. You also want to chill quickly after the boil. What yeast are you using? Who do you brew for, if you don't mind sharing? I have been leaving one of the pots on low while I chill the first one. Most recently I've used WLP300, notty, and belle saison. I'll be doing another brew either this weekend or next (belle saison this time), so I'll try it without the lids. I'm concerned that they don't boil hard enough without the lids, but I have been boiling off about 2 gallons from the 7.5 (estimated) that I start with. Hmmm, what kind of time frame between when you're ending the boil and when the second pot is chilled enough to pitch yeast? Ideally you want under an hour of total time to go from 212 to ~65F. It seems like you're boiling plenty of liquid off that DMS shouldn't be present in noticeable amounts. Brewer12345 is onto something with the cooling aspect because DMS continues to be created once you stop boiling until the temp is under ~160F. 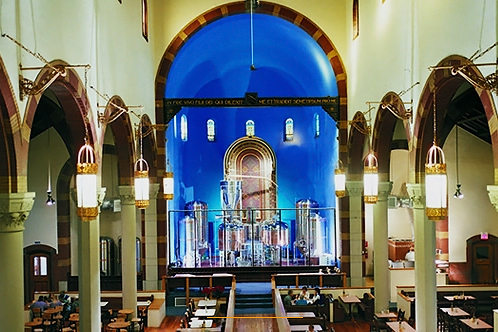 I work for the Church Brew Works in Pittsburgh, PA. A brewpub housed in a 100+ year old former Catholic Church. If you don't mind me tooting my own horn...my kolsch is awesome. I believe the recipe is somewhere on the first page. I also dry hopped with some 2 year old hallertauer I found in the freezer, which were the flavor hops in the recipe. Awesome! What size system you brewing on; looks to be 10-15 bbl maybe from the pic? Yeah, you certainly need to pick the times right to visit or you'll end up with an hour wait for a table or a jam packed bar, neither of which are really my favorite things. It's a 15bbl steam fired brewhouse with a combination mash tun and kettle, separate lauter tun, so that we can do decoction style mashes. My wife complained today that most of our beers (except the IPA) taste a little "funky" and she misses the commercial brews. Are you doing extract or grain? Extract often has a flavor that's been described a zillion different ways, as "corn" or "a bit funky" or "metallic". Some people notice it more than others. AG. Oddly, the brew that she liked best and that did not have any of this flavor was a partial mash. I bottled a hefeweizen Wednesday night. I nor her could detect any funk, but I'm afraid that was because of the overwhelming banana! Too much for a hefeweizen. I think I'll call it my banana wheat specialty beer and act like I meant to do that. WLP300, pitched a vial no starter, didn't aerate really, and fermented at 68F, so I guess not too surprising that it's a banana bomb. I wish there was a good dry wheat yeast so that I could be lazy and still get a proper wheat beer. I think I'll call it my banana wheat specialty beer and act like I meant to do that. This week in homebrew adventures I overhydrated my sourdough starter so the yeasty alcohol byproducts would separate out. Pitched that into apple juice + caramel, hoping to get something like those sour apple lollipops with the caramel in the middle. Hello. I decided not to post in the no alcohol thread. Instead, it seems more suitable to post here. In general (due to time/equipment restraints) I brew from a kit - which I pimp with sugars/hops. Mince ginger in food processor, add it to stainless pot with sugar and 5 liters of water - brought to a boil, turned off and let steep for an hour. Added juices, cayenne and seived through cheesecloth. Wrung out all the juice (ended up with 2lbs of ginger fibre). Put in fermentor (bucket). This is a really delicious, and I dare say nutritious, beverage that everyone LOVES. I more or less followed Skeeter Pee. This is my first time brewing this stuff. Instead of the concentrate he suggest, I used 9 tins of minute maid frozen concentrate and dextrose. My OG was 1.07 - last night I was at 1.002 and still going (should get to .996-8). I will stabilize then backsweeten with more concentrate to about 1.016. Will let you know how this goes! I keg everything in two corny kegs in my home converted mini fridge. Just had to respond to your frugal home brewing. GREAT way to get fruit juices to alcohol CHEAP. I've been brewing beer for a while now and I'll NEVER go back to 'pour it into a bucket...mix and ferment'. Yes, the beer wort takes about 2 hours to get to the fermentor, and then more time for racking and bottling so there is an investment in time and equip. but we don't have bottles of $1 beer anywhere at anytime around here. HOWEVER --- here is another way to cut down on brewing times for those that like shortcuts but truly enjoy the flavor of beer ~~~~ not fruit juices. Get a can of malt beer (such as Coopers, Brewers Best, Munctons, etc) usually costs about $15-26 per can depending on variety. Bring 3 gallons of water to a boil, slowly add entire can and leave at a soft boil for 15-20 min. Allow to cool to 80-90 F, pour it into a 5-gal bucket (clean of course), add sugar, amount will vary upon taste, and additional water to get to you desired quantity (don't cheap out and try adding more water) you won't like the results. Stir sugar vigorously for 3-5 minutes, then add yeast that came with the beer malt. Stir again vigorously for 3-5 min. and bottle using E-Z Caps (DO NOT USE REGULAR BOTTLE CAPS) into 2 liter PLASTIC pop bottles or equivalent. The entire project should take about 60-90 min. Here is a website that explains this entire process and you can purchase the proper caps from them. This works out to around $.35 - $.45 per 12 oz bottle. This is the only method I've tried that does NOT have the "home brew" taste, some of mine would rival any micro-brewery. Here's a favorite that most MISTER Mustaches will love --- Double Indian Pale Ale !!! MOD EDIT: Spam link removed. This works out to around $.35 - $.45 per 12 oz bottle. This is the only method I've tried that does NOT have the "home brew" taste, some of mine would rival any micro-brewery. Here's a favorite that most MISTER Mustaches will love --- Double Indian Pale Ale !!! Is this an advertisement post for EZCAPS Moderators? There is a dry Weihenstephen yeast on the market. Can't remember who makes it, but I have used it and it makes great weizens. Chill your wort to low 60s before pitching and you will tone down the bananas. I'd be interested to know what dry yeast you speak of. The Danstar Munich dry yeast that I used previously didn't turn out very well. The banana has mellowed out a bit from the wlp300 and it tastes great. That sounds really good. I'll give it a try soon as my carboy free up. Do you consume after the primary fermentation? Got a link to more detailed steps for your recipe? The hotel I was staying at this week had a Lemon Ginger wheat beer on tap from McCall Brewing. I was skeptical because I don't usually like wheat beers, but damn was it good. Really crisp and refreshing, without the usual cloudiness of a hefe. I thought I was done with brewing for the summer once my Imperial Red Experiment got bottled, but might have to take a crack at something like that. This is damn good stuff. no link...it is a composite recipe form a bunch of sources I've long since forgotten. To clarify...I used 5.5# of dark brown and 2.5# dextrose. Add another pound of each (which I do now) and you end up with 9.5% ginger beer. If you don't use fresh lime or lemon...make sure you use something that doesn't have sorbates in it. i.e...the minute maid frozen lemon or lime juice is good to use...if you didn't want to squeeze lemons/limes. For example, I would throw in 1 frozen lemon and 1 frozen lime concentrate. You might want to lower the dextrose by a pound when you do so...since there is a lot of sugar in the concentrate (or don't ;-)). I pitch EC1118 yeast. My starting gravities are up near 1.095. Now, I don't let it run dry...I halt fermentation around 1.014. This leaves enough residual sweetness. Swiper, bear in mind that I brew to corny kegs and carbonate with CO2. Thus, halting fermentation with sorbate at 1.014 is not problem. If you bottle, you will probably ferment to dry, backsweeten with lactose to 1.014 and bottle as usual (with X tsp of sugar to carbonate). Please let me know if you want more direction. Total cost to make 20L (I have 19L corny kegs) is $25 for all ingredients. P.S. make sure you pineapple juice doesn't have any sorbates also! This was wicked awesome stuff! I'm brewing my second batch now. Somebody talk me out of buying a $400 kegging setup. Includes 3 kegs (2x 3 gallon, 1x 5 gallon) co2 tank, kegerator, everything for a kegging setup. Local guy on craigslist. acid chat: So I brewed some caramel apple cider with my sourdough starter in an attempt to get a sort of sour caramel apple beverage. Have been tasting along the way and it was going surprisingly well (sweet, tart, tasty) but I let it go too long and now it's hella sour. Like almost undrinkably so. Two questions: (a) Is there anything I can do to fix what I have? It's only .75 gallons so I don't mind dumping it, but if there's some easy solution I wouldn't mind trying it. (b) I'm familiar with methods of stopping yeast fermentation, but what can I do to stop both the yeast and the lactobacilli. Or even better, just the lacto and leave the yeast alone, but I don't think that's a thing. It's my understanding you can either use campden or pasteurize it, but that'll kill both. The other thing to do is blend that beer with another one that is not sour. Make sure to kill the lacto first. The other beers yeast can take over at that point. I suggest you mix it to taste. Mix some in, give it some gentle stirring, give it a little bitty taste. I got lazy with the bottle cleaning on the wheat, and about 1/4-1/3 of the bottles are horrible. Bottled a saison and was much more careful, got a surprising amount of spiders, mold, goo, etc. out of the bottles. Must be why the wheat sucked. Doing a doppelbock soon that I'm going to try pitching on a yeast cake from my irish red lager which is now lagering. I'm a little concerned about the yeast cake as it will have been lagering in primary for a month+ by the time I pitch the new beer. Any thoughts on whether there will be too much autolysis? If your fermentation was healthy and sanitation good, I would not worry about autolysis. I have repitched on ale yeast cakes that have been sitting for 3 weeks in the primary and had zero issues (aside from explosive ferments). It really depends on how long the yeast has been stored and at what temperature, but generally for lager yeasts repitching after more than two weeks becomes more and more detrimental to the overall health of your yeast. Viability goes down, autolysis goes up. You also should probably not repitch the entire yeast cake, even when you're stepping up from a red lager to a doppelbock. Not sure if you have the ability to wash yeast or at least collect it in a sterile fashion and repitch an appropriate amount of slurry. Of course these are all points on a spectrum of how nit-picky you want to get and it just comes down to what you're willing to accept or capable of doing with your equipment. Homebrew is often much more flexible because you'll be drinking it fresh. I don't know if anyone on this thread is from (OK), but I'd love to find a fellow brewer in the area. Otherwise: Great topic!!! Thanks for all the suggestion guys! I really want to try different types of brew. Ummm what? I'm slightly queasy, yet intrigued. apple liqueur (unspiced) finished in the freezer over cooked bacon for 24h. It's more of a slight smoky flavor really, too bacon-y and I can imagine it tasting very very bad. I made an AMAZING red with a wonderful maltyness. Over the course of 3 weeks the sweetness went away and my very low bitter beer turned into almost a nothing + bitterness. I suspect the keg must be hosting an infection? If that's the case, what's the best way to clear said infection up. Before I kegged, I filled with sanitizer and let sit for 5-10 minutes shaking vigorously, I do not think I pushed co2 through the line...would that be the culprit? I do think that there had been in the beer previously. note* I would drop the chocolate malt and add the same volume to the Red X, it was a little to dark as I was trying to get it to be RED not cloudy red. 2nd substation was changing the Munich - Light 10L to Red X.
I would suspect an infection. Bleach all of your equipment and rinse thoroughly. "all equipment" means anything that is used to transfer and or store beer? Auto syphone, keg it self, beer lines? Anything else i'm missing? Hydrometer, thief, whatever goes in the beer on the cold side. I was pondering starting with maris otter + hop of choice, doing small batches and learning what I can. I listened to a pair of great podcasts from beersmith to help get the ball rolling. Just curious of others experiences. I never did. Just bought a kit and jumped in with an extract clone recipe. I haven't done a true SMASH, but have done some really simple beers. My favorite lately is a Session IPA with 50% Maris 50% 2-row and a mix of hops (really just using up excess) to get to about 4.5% ABV 45IBU. Its so good, and better than most of the IPA's I can get in town. We crushed through a keg in a week with the help of our friends. If you're part of a homebrew club start suggest to do some experiments as part of your meeting. We did a dry hop one where we took bud light and dry hopped it with 20 different hops so we could sense the change in aroma. Much easier to get variety as a group than trying to do it on your own because everyone is likely to have 1/4-1/2 oz of a random variety of hops. I think we are also planning to do the same for bittering hops in a few months. How do you lager it once it's done fermenting? Refrigerator? As a matter of clarification, lagering is the fermentation. The fermentation takes place at cooler temps. As the fermentation progresses, the temperature is (typically) lowered. Personally, I find it hard to justify a third fridge (1 - food, 1 kegerator) to make lagers. I only brew ales. Currently, I have an all-grain Oktoberfest (aled, not the traditional Marzen/lager) and an all-grain oatmeal stout in the primary. A second Oktoberfest is lined up to start this weekend. This brings up a bad point I made. Lagering in a homebrew setting is done after fermentation.